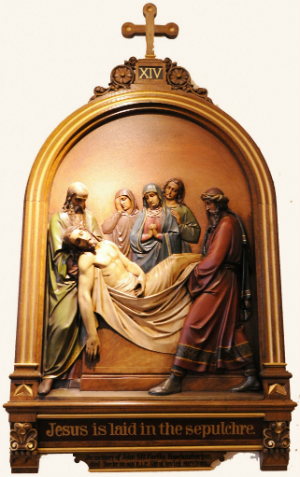 S A CHILD, I went to Catholic school, where I was happily made to memorize the 14 Stations of the Cross. Since that time, the Stations have been one of my favorite devotions because of how they so naturally draw us into the human suffering of our Lord. I’ve always liked the somewhat abrupt manner in which they conclude, with “Jesus Is Laid in the Sepulchre” and the sealing of the tomb with a giant rock. The Stations leave us with an unmistakable sense of sorrow and sobriety. There’s a certain finality and gravitas to the devotion. Imagine my surprise the first time I encountered a Stations of the Cross booklet marketing 15 stations. What is this about, I wondered? What were the Stations lacking that needed to be fulfilled with a fifteenth station? Needless to say, I firmly believe in the Resurrection and cling dearly to that belief as the hope of my eternal salvation. But I would rather linger a bit with the mystery of the tragic than leap irreverently into a shallow buoyancy. People naturally crave happy endings. We love stories that end “happily ever after.” We long for music to come to resolution. We are thrilled by feats of athletic success (especially by the underdog). Everybody loves a happy ending. Yet, so much of our human experience is punctuated by grief—the experience of a not-purely-happy ending. Life is filled with death, disappointment, loneliness, illness, addiction, etc. We may look forward with hope to the Resurrection, of course, but, in the here and now, tragedy is very real. Good art has the power to capture all of this. OR THIS REASON, I was quite pleased on my recent visit to New York City. 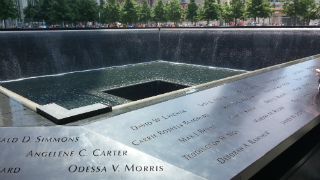 When I visit NYC, I rarely find myself in Lower Manhattan, but on this particular trip, I took the subway down to the World Trade Center site to tour the newly opened 9/11 Memorial. The site left me with the somber feeling of the fourteen Stations, not fifteen. Prior to this visit, I had seen pictures and video of the monuments, themselves—the empty black footprints of once-grand buildings that catalog names of the departed above walls of cascading water. Serious art criticism is not a competence of mine, but my initial reaction to pictures of the memorial was rather negative. Having finally experienced the site, after nearly 13 years, my reaction is now much more positive toward the manner in which the memorial was executed. It is clear that the intention was to capture the sense of loss experienced by so many family & friends of the victims of September 11th, 2001. The names along the railing, for instance, are not merely engraved, but actually cut clear through the stone, highlighting the void that has been left by that person’s absence. Moreover, one cannot see the bottom of the pit into which the water falls, presumably symbolizing the emptiness of the place. For some people (like me, initially), perhaps the place is too somber. Shouldn’t good art, though, be able to communicate something of the catharsis we all experience? I, for one, am grateful that those who conceived the 9/11 Memorial did not make the same judgment made by the publishers of the 15 stations booklets. Instead, they resisted the temptation to force the “happy ending.” Tragedy is real, it is concrete, and it must be dealt with squarely. There is always hope of resurrection, to be sure, but jumping the gun to hope can shortchange us of a healthy period of reflection and grief. T OCCURS TO ME that, when the rising eighth-graders set off on their field trip to NYC this spring, they will be the first class of students to make that annual trip from our parish who have known only a post-9/11 world and have no personal memories of the highjackings & crashes & implosions. At least, by visiting this somber site, perhaps the students will be able to appreciate in some limited fashion the anguish & agony of that terrible day.